Will these couples make it or break it? WE tv just announced a new season of Marriage Boot Camp: Hip Hop Edition will debut in January. 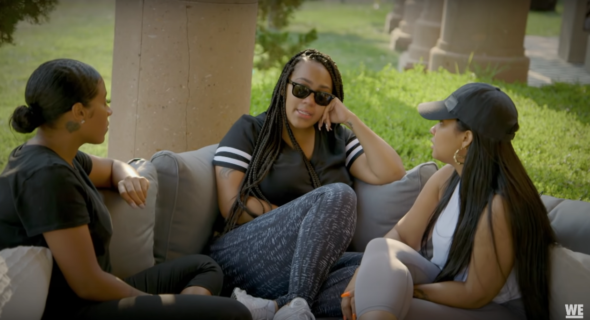 The documentary series follows prominent couples from the world of hip hop as they take a two-week break to work on their relationship with therapists. This season features Waka Flocka and his wife Tammy Rivera, Jessica Dime and her fiancé, professional basketball player Shawne Williams, Soulja Boy and Nia Riley, and Lil’ Mo and her husband, boxer Karl Dargan. The new season of Marriage Boot Camp: Hip Hop Edition premieres on WE tv January 10th at 10 p.m. ET/PT. This season, some of the biggest names in Hip Hop are moving under one roof to put their relationships to the test. In the glamorous world where business is mixed with pleasure and exotic temptations are knocking on every door, a lifestyle in the fast lane can be both a blessing and a curse. Soulja Boy and Nia Riley, are crankin’ up the heat with issues beyond repair. Soulja wants to get married but Nia struggles to free herself from his control while caught in the crossfire of his vicious social media attacks. Rapper Waka Flocka and his wife Tammy Rivera may look like everything’s all gucci, but salacious rumors of infidelity say otherwise… It’s make or break for Hip Hop’s Superwoman aka Lil’ Mo and her husband, boxer Karl Dargan. Allegedly, Karl has been unfaithful in their marriage while Mo, the breadwinner, is ready to put all the side chicks on full blast. For “Love & Hip Hop: Atlanta” star, Jessica Dime and her fiancé, professional basketball player Shawne Williams, Boot Camp is their last resort. Shawne has put a ring on it, but has yet to set a wedding date in 2 years! Reuniting for the first time in months, Lil’ Fizz of B2K Tiffany Campbell from “Love & Hip Hop: Hollywood,” make a last-ditch effort to reignite the spark before the love completely fizzles out! But Tiffany isn’t the only ex Fizz will bump bump bump into! Dr. Ish and Dr. V are back and upping their therapy game by pulling these couples straight outta hip hop and straight into the toughest two weeks they will endure to salvage their toxic relationships. The Boot Camp quickly launches into breakdowns and blow ups when the couples are stripped away from the VIP treatment and find themselves pleading their case before Judge Lynn Toler from “Divorce Court.” In the end, these couples will have to face the music and make the ultimate decision. To leave together or break things off forever. What do you think? Have you seen Marriage Boot Camp: Hip Hop Edition? Will you watch the new season? More about: Marriage Boot Camp: Hip Hop Edition, Marriage Boot Camp: Hip Hop Edition: canceled or renewed?, WE tv TV shows: canceled or renewed?